Overwatch’s Summer Games end on August 29, which means there’s not much time left to get good at Lucioball. Except no one is that good at Lucioball, even the players ranked in top 500. But while players who hate it have already gone back to playing Rocket League, the competitive Lucioball players left standing have done their best to rise above the game’s quirks. 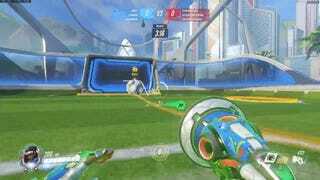 Lucioball is a 3v3 soccer mode in which every player spawns as the healer Lucio. They pelt a giant ball around a field using a specifically-tuned array of Lucio’s moves and try to score on the other team’s goal. Lucioball debuted in last year’s Summer Games, and this year, there’s both casual Lucioball and a “Copa Lucioball” mode, which will award you a player ranking à la competitive Overwatch. Since last summer, Overwatch has made a couple of big changes to Lucioball. Last year players could use Lucio’s Soundwave to push other players, but that has since been removed. Lucio’s Ultimate no longer pulls the ball towards him, so players can’t hide inside another team’s net and sneak a goal in. The removal of those two elements has helped Lucioball feel more balanced, thereby justifying the game’s new competitive-only mode. A crop of fan-run online tournaments for Lucioball are already underway. That said, high-level competitive Lucioball doesn’t look that different from casual play. The game’s tough on everyone. Immediately following this unlikely save, Muselk’s teammates fail to get the other team’s goalpost to register a point. What goes around, comes around! Erin Catto, the Overwatch team’s principal software engineer, described the move as “an emergent behavior” that works because of the player’s collision mechanics. This move takes practice to pull off, and its existence proves that there are still techniques left to discover in Lucioball, just in time for the last week of competitive play and tournaments. Here’s one last technique that won’t elevate the game, but will elevate the irritation of the other team, which could potentially work in your favor. You can apply one of Lucio’s graffiti sprays directly to the ball, which won’t move it forward, but will allow you to show off. If you’re not above psychological warfare, you could add this new form of taunting to your Lucioball toolbelt. Otherwise, keep an eye out for players hopping on the ball in competitive mode.